Why an Ultra Slim Watch? As the saying goes: "the thinner a watch is, the higher its perceived value". From Movado to Rado, 'THIN IS IN'. If you're looking to offer an affordable gift watch which goes a long way in impressing your customers, you've found it! They'll believe you paid many times your actual cost. 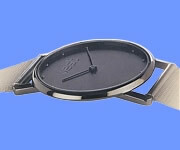 An Ultra Slim logo watch with YOUR company logo on the dial will be most appreciated by all who receive it. Take a look at the samples below. Hopefully one of the promotional logo watches presented here will fit your idea for the perfect gift watch with your logo on the dial. BONUS WATCH BENEFITS: One Free Watch for Every 100 Ordered. Why not choose the Fotowatch Advantage. Order 100 Watches and get 101! Order 200 and you get 202 - and so on! Your free bonus watch is our way of showing that here at Fotowatch, we appreciate your business.